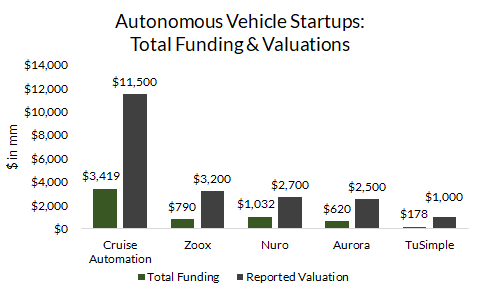 Chart of the Week – The Funding Tap Is Running for Autonomous Vehicle Startups, but When Will the Technology Be Ready for Mass Public Rollout? Smart vehicles have long been a science fiction staple (see “Sally,” first published in 1953), and readers have wondered for decades how AIs and humans might co-exist in the distant future. Within the last few years, that reality seems to be approaching as large companies like Tesla and Alphabet’s Waymo pave the way for driverless cars. In parallel, startup funding has proliferated the number of self-driving car companies seeking to bring autonomous cars to the masses. At the beginning of February, Amazon (NASDAQ:AMZN) led a $530 million investment round in Aurora Innovation. Nuro, a self-driving vehicle startup for local goods transportation, announced a $940 million Series B round led by the SoftBank Vision Fund only a few days later. Just last week, TuSimple, a U.S.-Chinese tech startup seeking to commercialize self-driving for long-haul semi-trucks, raised a further $95 million. Finally, Cruise Automation, General Motor’s inhouse driverless car unit, received a staggering $2.25 billion from the SoftBank Vision Fund last year. Driverless car technology is currently being testing in limited trials, mostly within California and Arizona. The commonly-used proxy for progress for this technology has been the number of miles autonomous vehicles have logged; as these vehicles log more miles, the artificial intelligence and machine learning software is trained to better handle various driving situations (see Waymo’s post about reaching 10 million miles). California requires startups that have autonomous vehicle permits to report the number of miles and times autonomous vehicles have disengaged their software in favor of human intervention. Cruise logged 447,621 miles in 2018, a 245% increase from 2017, and 86 disengagements, a 18% decrease. Aurora logged 63,512 miles by November 2018, a 448% increase over 2017, and 279 disengagements since August 2017. A full list of companies and their disengagement reports can be found here. The number of disengagements and the increase in miles, however, do not paint a complete picture. Stories like an Uber autonomous vehicle killing a pedestrian and Mobileye cars running a red light demonstrate the current shortcomings of the technology. Some of these errors can be attributed to the response time of these vehicles. In other words, the computers behind autonomous vehicles take longer to calculate what to do than humans, causing lapses in safe driving. Companies counteract this shortcoming by reducing speeds. For example, Uber, after halting tests in Arizona, restarted testing at reduced speeds of 25 mph, compared to 55 mph prior to its fatal accident. Though we’ve seen large leaps, the technology is still not safe enough for widespread release. Currently, the technology has only shown to work in limited use, best case scenarios. The real test of the technology will be in subpar conditions, whether it be inclement weather, bad roads with minimal to no signage, or construction areas. Startups are testing autonomous vehicles through limited use permits that have required vehicle operators to be present. Other states have joined the driverless car movement by enacting legislation or executive orders. As states adopt various safety measures and definitions, they contribute to a piecemeal regulatory landscape that is not conducive to a wide-spread rollout of the technology. Federal regulation, outside of NTSB guidelines, will be required to provide a framework for state legislatures to follow, reducing competing laws and ordinances and allowing autonomous vehicles to operate across state lines and state and federal roads. Autonomous vehicles will bring about a paradigm shift in the automobile industry. Consumers will begin to interact with vehicles differently, challenging current liability and insurance frameworks. In the event of an accident, a slew of questions will need to be answered, including: Can crashes be attributed to faulty software? Do drivers share in any liability in the event of a car crash? A death? Will damages be transferred to manufacturers, much like in a recall? How will car insurance intersect with autonomous cars and their owners? The importance of these queries lies in fault and damages. Autonomous vehicles have been billed as a safer, more convenient mode of transportation of the future. The reality is that mishaps like the recent Uber and Mobileye events will happen, and if a driver is not operating the vehicle, where does the fault lie? With any new technology, legislation will need to be enacted to answer these questions. In the absence of clearly defined laws, the court system will intercede, creating common law that may not be optimal for stakeholders within the sector and will contribute to an already fragmented regulatory and legal landscape. Want to learn more about SoftBank? Check out EquityZen’s SoftBank Report. If you’re curious about the artificial intelligence and machine learning technology behind driverless cars, check out our Artificial Intelligence Overview.